Made a bumper kit guide too because why not \_(._.)_/ . PLEASE READ THIS BEFORE SCROLLING DOWN TO THE PICTURES or you might be confused. x - whatever move you have to do to get the egg home, you're already outside the egg. One arrow is where you sit to enter the egg, the other is where you end up after the last move. Same colours are obviously same route. The way arrow is turned is the way you're supposed to face. As a bumper user, you're the last in hierarchy. You have to let bomber and speed kit users go. That's VERY important near the egg area. LET THE SPEED USERS GO FIRST BECAUSE THEY ARE FASTER. Green and blue route are quickest. This one might be a bit confusing, sorry. There is basically 1 way to enter the egg, and 2 ways to exit, just the moves are clearly different. Same as previous map. Different exits, same position to enter, but your bumper kit is faced other way than in previous picture. *Another way to exit the egg is also possible, if the main 2 ways aren't doable. If you are sitting on the egg, do: F F W L, L x x x. You take no damage, and you end up outside of top pool. Basically 3 ways to enter the egg, and you end up on the same spot in the end. Some people tend to use pool in egg area and some bump a rock to use winds in the exit, but that kind of messes up people behind you, so try to use the same route as everyone else. If you can, try to use the green route. It's easier and quicker. Green route is obviously quicker so if you can take 2 bumps, always use green route. If you can't do any of these routes, please ask someone on your KH run for help. I'm sure people would be more than happy to help, rather than get blocked, stalled for few turns or potentially killed. If you have some advice, suggestion, complaint or whatever, do let me know. Map 8, you haven't put the side/front entry exit via the rear/side (do the egg backwards basically). It's useful on some maps. Map 9, You can do a 0 bump entry and exit via the middle of the 3 side pools. Thanks for this Noddy, it's good! Thank you for taking the time to do this. It is extremely helpful. Thanks for this. I will look again and comment more later because I see a few things I do still differently. For now, I just want to add that most times, when there are two eggs, I (on a bumper) choose to go for the less popular, often farther, egg, to avoid the traffic. Of course, that will generally take longer and I usually am only able to bring home two eggs at most. But at least I won't cause delays to speed kits, and they won't inadvertently push me off my path when I should be paused. *I edited this quote to be a bit more informative, I didn't add moves for the first route, because there's 3 potential routes in, and 2 routes out using this method. All depending on what rock formation you have near the entrance. However, you'll almost always be able to do it from the yellow arrow, this is of course 2 bumps, (or 1 if you start with a F, instead of an R.) Starting from the orange arrow is the best though, since it's 1 bump (start with an R) and the same speed as yellow route. Map 9 you can also use both whirls either side of the egg, it's the same number of moves, idk, maybe there should be a note of that. Entering at path 1 the two bump route would be, LFFX, LFRX, XFF. Map 9 a lot of people also like to exit on the back right sort of bit, if you are conscious to be out of the way of speed boats. (from position 1) LFFX, RXXF, XRRR. 2 Bump aswell. Since we're in bumpers, map 6 can also be done one move quicker at the penalty of a second bump. LLRW, RRLW. This route could be pretty useful on beginner runs, since the paths don't cross, so you just have to enter with one space between you, and then no worry of waiting for each other. It's also noteworthy that the aforementioned route can become 1 damage only, if you follow someone on the exit. This trick is useful for speed boats too. Allowing the first boat out exit 1 to take 2 damage, and the following boat remaining undamaged. Just have to remember that the standard LLR exit, will leave you one east of where the exit #1 is located on the map. Just realised I've used X's instead of W's. Lots of people do this when calling moves, some also use underscores '_' or dashes '-', so something to watch out for. - but first route mentioned above is best if there are other rowboats in the area (because paths won't cross), and quicker, too. 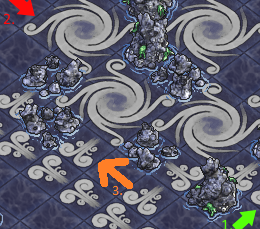 - this can be no damage if the area at the exit is as pictured. Just go F R R W on the last turn. - also no damage if you prefer to go towards the edge of the map (if there's an exit in that direction). Just go L F F W on the last turn. Damage galore follows, of course, depending on how long the rocks are on that edge to the exit. - The above takes longer but it's just in case there's trouble in the kraken head exit area. - just wanted to point out... that last W on your red route should be R, I think? Sort of redundant when the other routes are quicker for the same number of bumps, only real advantage is you can let other boats past, could help relieve stress if you're not being followed I guess. Pretty trivial since this guide assumes they will be at the arrow on the first move of a turn, this of course isn't going to be the case a lot of the time, so changing the waits shouldn't matter too much. I'd advise against this because it leaves you with only 1 path to take, this could make dodging others difficult. The previously suggested routes, allow you to take three possible routes from egg to exit. Although I do feel the map 5 route is not what I'd suggest in general, because if the tentacles are up when you want to leave (bombers not having a perfect day), exiting with your boat turned sideways is not ideal. Having the boat pointed in the direction of the winds allows for much more manoeuvrability to dodge incoming tentacles. It also allows you to queue much nicer, if a bunch of people are entering before they can leave. I'd suggest this route instead of the original one. This route can be done no matter your position in whirl 2 (numbering anti-clockwise). 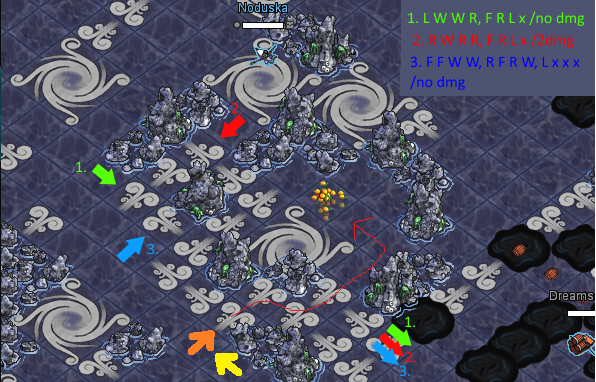 However the original route suggested relies on a certain position in whirl 2. There's actually a quicker way to do this with the same result. I'm going to quote Budclare. This actually leaves you facing a nicer direction too. This is correct, there is a mistake. Honestly though, I think the number one thing any guide should stress is how much timing matters when leaving the egg nest. It's the mistake so many new players make, leaving the egg, only to be stuck under the kraken head when it spawns. I'd recommend players only leave the egg nest the turn, or the turn after the head is bombed. Giving ample time to escape the vicinity of the Kraken head, not to mention how there's always a cluster of tentacles spawning close to this, so you want to be as far away from them as possible when the time comes. But actually, this wasn't simply a changing of the position of the wait. The original suggestion requires you to turn right while in the whirl so that you'll be in the desired position at the end of that turn (south corner of the whirl facing out). My variation requires you to just enter the whirl and sit there until you end up in that position at the end of the turn. For people (like me) who find whirls confusing in the first place (we sometimes feel like deer in headlights =P ).